Evolute springs are an important spring and damping element, they are used mostly in railway vehicles, but also as an integral part of a number of machinery devices. An expert in the production of evolute, i.e., conical band springs, is the SV výrobní company located in Prostějov. Evolute springs are conical band springs produced according to the UIC 820 and UIC 823 norms. 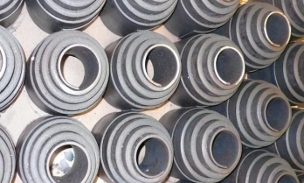 For their properties they are used mostly in connection rods and buffers of railway vehicles and further for spring-back of heavy machinery units. They are a necessary part of crushers, power shears, grinders or tipplers. They are largely used also for shock absorbing in lifts, piping and blast furnaces. The range of evolute spring application is thus really wide. They are suitable everywhere, where a big emphasis is put on damping with respect to the springs’ strength and hardiness. The SV výrobní company produces evolute springs and other spring elements with maximum precision and an emphasis on compliance with the strictest safety and production rules and standards. Thanks to that, the springs from this company have become sought-after among Czech customers, as well as the foreign ones. The evolute and other springs from this Czech producer are in demand also in Slovakia, Hungary or Slovenia, particularly then in the field of railway transport. Evolute springs and other spring elements (compression, tension or leaf springs) will be designed according to given specifications or a supplied sample. Based on the parameters, concrete evolute springs will be then produced in the required amount. That is why you should not look for a catalogue of offered products at the company’s website, for it is possible to produce springs with almost any parameters. The company provides a design and calculation of springs according to the customer’s requests and instructions.The specific parameters, with respect to the use, can be consulted and together the best solution can be found. A part of the offered services is also a possibility of design and construction according to the supplied sample. Evolute springs can be also optimalized so that the functional parameters remain the same while the spring’s weight is reduced. This can be very important in some specific constructions, for there are cases in which reducing the spring’s weight can very positively influence the quality of a particular functional solution. The springs’ parameters will be thoroughly inspected and tested on our own testing device.